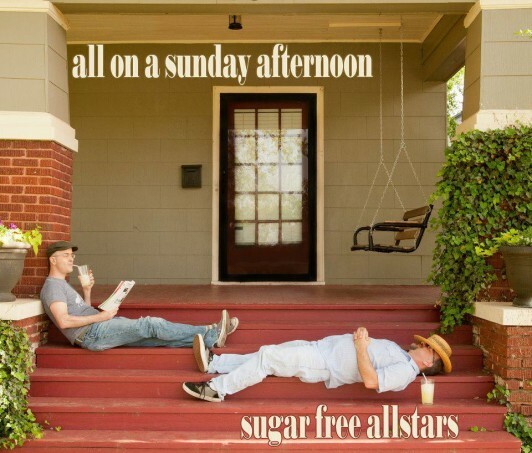 The Sugar Free Allstars are back with their third kids’ album, “All On A Sunday Afternoon.” This album, like other releases from the duo of Chris “Boom” Wiser and Rob “Dr. Rock” Martin, contains the usual infectious funk/soul/rhythm and blues sound while also paying tribute to Motown and Stax Records. And, they’ve brought some additional friends to, er, pump up the jam. “All On A Sunday Afternoon” is filled with sentiment and love and feels as though it is coming from the personal parenting experiences and musical influences of its creators. This is most evident in “Sunday Afternoon,” (featuring additional strings from Keith and Ezra of Trout Fishing in America) which talks about spending time with family, as well as, a couple of smoother jams like “Very Best Friend,” a sweet little song about love and companionship, “99 Questions,” a gospel number featuring Wiser preaching about gaining a better understanding of the world by asking lots of questions and “Ready To Give Up Teddy,” a heartwarming ballad expressing a child’s feelings about being ready to give up sleeping with their teddy bear. But, instead of being sad about the separation, the child is reassuring Mom and Dad that they are ready for it. The song coincidentally has some parallel melodies to “Easy” by the Commodores which further supports the bands appreciation for Motown. The album starts out strong with the high-energy “Gotta Get-Up,” featuring the addition of Shawana Kemp from Shine and the Moonbeams and Jack Foreman from Recess Monkey who make excellent and very convincing advocates for getting out of bed in the morning. I like to think of them as sort of a power-up brigade. Along with the album release, the duo released a video featuring stop motion animation by Kyle Roberts of Reckless Abandonment Pictures. The video is packed with action, literally and figuratively, as the duo are turned into action figures while other toys are taking over and trying to get Wiser out of bed which includes everything from cookin’ some eggs to a firetruck rolling Wiser’s clothes over to him. And in true Sugar Free Allstars fashion, we are called to participate in a funky dance called the “Stretch and Yawn.” It’s easy and gets your energy flowing. The following song, “Hiccup” a fun and educational song which is filled with the beloved Allstars organ sounds and some handclaps while adding commentary informing us about the science behind those little buggers. “Put ‘Em Away,” is a fast paced funk-venture that puts a fun little twist on the traditional clean up song and it features awesome auxiliary percussion by Marty Beller of They Might Be Giants, as well as some sweet bass by Jay Wilkinson. Another notable song is “Love Train” which not only features Keller Williams giving the song a psychedelic edge with the addition of a guitar and kaosilator, but also features the family funk host Sir Groove-A-Tron. As a big fan of the Talking Heads, I was pleasantly surprised to hear the Allstars perform their own version of “Stay up Late” which is an excellent rendition of the original version but with the bonus of some sweet organ noise. The Sugar Free Allstars have once again produced a fun series of songs that are sure to be enjoyed by the 3 through 8 yr old crowd. The 36-minute album also features a full-length concert DVD which provides some insight into just how energetic and powerful the live shows are. You can stream the album below, as well as, view the video for “Gotta Get Up.” Enjoy! Disclaimer: I received a copy of the album for possible review.